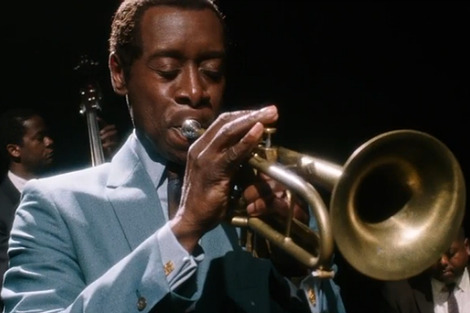 The original title for this semi-fictional biopic about jazz great Miles Davis was Kill the Trumpet Player. In a way it would have been a more fitting moniker than the hokey, hollow pun 'miles ahead' that made its way onto movie posters. It better evokes the 'biography as gangster movie' mode in which the film operates. The switch to a more genteel title however reflects a deeper identity crisis within the film itself. Iconoclasm grapples with reverence. In the end reverence wins, to the film's detriment. It opens in the late 1970s with Davis (played by Cheadle, who also co-wrote and serves as first-time director) living alone, battling chronic pain from a hip operation, and existing in a haze of drugs, booze, creative impoverishment and bad memories. A (fictional) Rolling Stone reporter, Dave Braden (McGregor) shows up, chasing a story by trying to coax Davis out of retirement. When a recording of new music is stolen from Davis' home, Braden is dragged into helping a gun-toting Davis get it back. It's no surprise to find that Cheadle's performance is terrific; he is a fine actor. He learned to play the trumpet for the role, and does a convincing job of emulating the technique and mannerisms of the trumpet player. His world-weary, tough-talking 1970s Davis is a treat to behold, his voice a wreck but replete with menace and hard-won wisdom, his posture bold despite his pronounced limp. McGregor's Braden is softer and sneakier. As a cinematic double act, they work. Yet the film bears the marks of a long-time actor who has decided he has what it takes to transition to directing. You get the sense Cheadle as director didn't want to make a mere movie; this is a Film. "The flashbacks deal with Davis' (documented) abuse of his wife Frances Taylor, but only to show us why 1970s Davis is so desolate. Taylor herself is marginalised." As such there are moments of artsy artifice that take the viewer out of the experience, rather than more deeply into it. It's not enough for Cheadle the filmmaker to cut to a flashback, for example. Instead he has Davis open a door in the back of an elevator and peer through to a scene from his past. This overbearing artifice extends to the film's structure. It includes two timelines: the main one features the aforementioned caper in the late 1970s; the other, earlier one finds Davis at the peak of his career, and focuses on his courtship of and marriage to dancer and album cover model Frances Taylor (Corinealdi). These timelines flow in and out of each other with the insouciant rhythm of jazz itself, but such a shambolic structure also obscures and distracts from the slimness and shortcomings of the story. Notably the fact that while the film pretends to warts-and-all authenticity, even the warts are exhibited for sympathy. The flashbacks deal with Davis' (documented) abuse of Taylor, but only to show us why 1970s Davis is so desolate. Taylor is marginalised; in one scene, as she and Davis argue, the dialogue comes down and the score comes up; her voice is literally taken from her. When Davis then physically assaults her, the message is clear: his music and his violence are notches on the same spectrum. This conflation of creativity with destructiveness is a typical error of mainstream biopics about great artists who were not nice people. It continues elsewhere, in a scene were 'younger' Davis plays trumpet in a boxing ring while 'older' Davis brawls below. Yet applied in the context of spousal abuse it is not only specious but an ethically dubious, even downright dangerous perspective, which is tone deaf to more nuanced notions of creativity and the origins of male violence, against women and otherwise. Davis was a great artist, and his music features prominently in the film. Fans might be better served purchasing the soundtrack rather than a movie ticket. Today I walked past the bathroom and noticed a pale yellow puddle with an odour worse than an unflushed toilet. I cringed at the stench, with the realisation that I had to wash urine off the floor ... Dad's illness sometimes causes ambiguous loss. It is unclear, has no resolution or closure. He is like someone I don't know anymore; he is gone-but-still-there. This leads to complicated grief. I can't look at him without seeing a fading picture of who he used to be, and speak of him in the past tense. Brunette or shocking white, these wallabies have their own special nook nearby, under that blackwood. Why just there, I ask myself: no particular foliage has given a meaning to the spot. Something about bone-dry shadow under those boughs appears to murmur clan or family. Yes, I know that sounds kind of patronising, but when these animals go through their routines we can see a social order clear as day.